Documentation and SupportReleases Sassafras Release Notes 2016-06-07It is now possible to lock or unlock tables. 1. 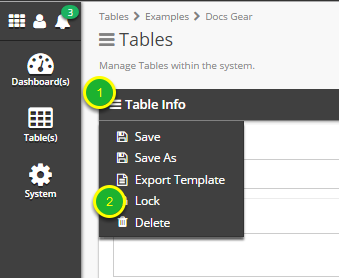 While in grid view of a table, open edit mode. Click the sandwich to open the menu. 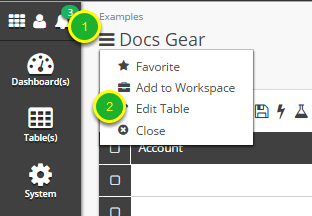 Click 'Edit Table' to switch to edit mode. 2. Open the menu and lock the table. Click the 'Table Info' menu sandwich to open. 3. The table is now locked. 4. To unlock a locked table is a similar process. 5. The table is now unlocked. Prev: Business Process Update Provides Added Functionality. 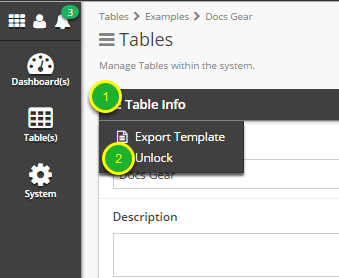 Next: It is now possible to choose which table opens when resuming a session.